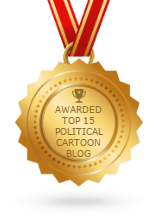 “Dear Leader” – the Latest Edition of the ‘News in Cartoons’ on our Humor Times App! New edition: “Dear Leader” – Enjoy the latest hilarious editorial cartoons, reviewing the news in our Humor Times “News in Cartoons” app, available free! 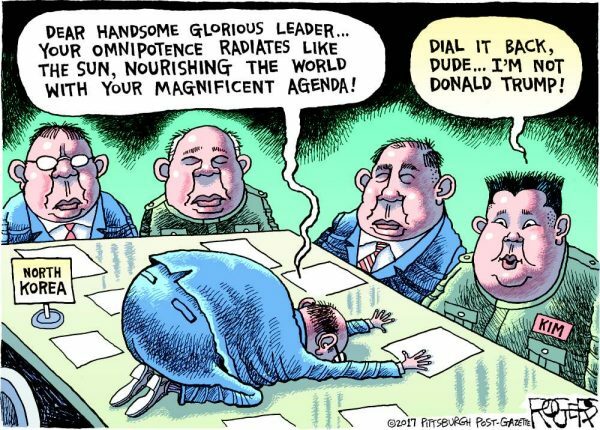 In the latest edition of the “News in Cartoons” Humor Times app, called Dear Leader, the world’s greatest editorial cartoonists (who also populate our popular Humor Times magazine) review the latest news in the way only political cartoonists can. Follow cartoon Donald Trump as he convenes his cabinet for a love fest — with all the love directed one way, at him, as previously dignified government veterans prostrate themselves before the Dear Leader. Of course, the sham that is the secret, behind doors, crafting of “Trumpcare” is examined, as well as the ongoing investigation of the president. The app also features a “bonus cartoon” each issue, as well as a funny video of the week.